Visitors admiring photographer Colleen Sullivan's work. The Cultural Alliance of Medfield (CAM) has announced its fourth annual Holiday Stroll on December 7 from 4:00 – 9:00 p.m. This is a festive family event that takes place at 17 venues along Main Street and North Streets, North Meadows Road (Route 27), and at the Dwight Derby House on Frairy Street. 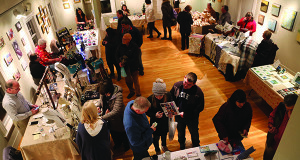 Visitors roam the Zullo Gallery during the 2017 Holiday Stroll. This year’s Stroll has been scheduled for Dec. 7. 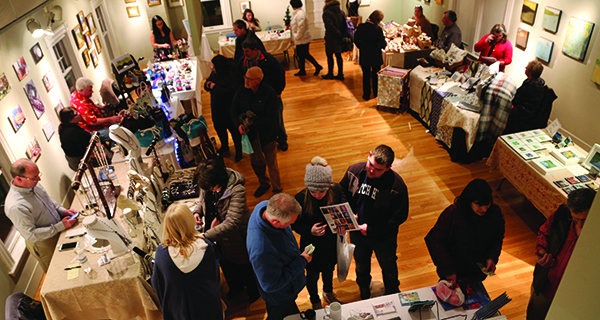 Included are 40 juried artisans at three main locations (Medfield Library, United Church of Christ, and the Zullo Gallery), an outdoor ice sculpture demonstration, food vendors, carolers, photos with Santa and M.E.M.O.’s outdoor tree lighting ceremony. All events are within walking distance, with free admission and parking nearby. For complete details and a list of participating artists, visit www.MedfieldCulture.org. The Cultural Alliance of Medfield is a 501-c-3 organization established in 2015 to nurture, support and promote culture in Medfield. The Holiday Stroll is made possible in part, by the Mass Cultural Council, a state agency.